Only 5 in stock, order soon! Combat-proven in Iraq and Afghanistan, the VHS has been field tested over military uniforms and general hunting clothing with great success, and thousands are in use by American armed services personnel fighting the global war on terrorism. A key component of this patented shoulder system is its spider harness. All four points of the harness pivot independently and are connected by their clover-shaped, Flexalon swivel back plate. This, along with patented swivel connectors, results in a perfect fit and lasting comfort for virtually all body sizes and shapes. 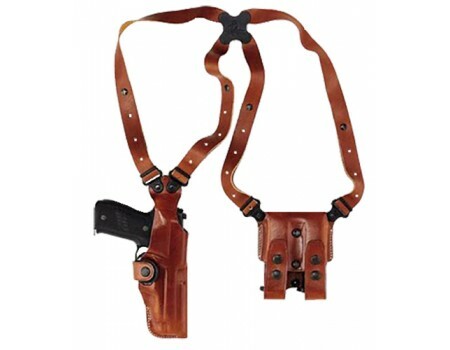 The Vertical Shoulder Holster System consists of holster, harness, ammo carrier and a set of system screws. I've owned the Galco vertical shoulder holster for over a year now, wearing it 3-5 times per week. PRO: 1. high quality leather as you come to expect from galco. 2. retention is very good; no problem doing acrobatics while wearing. 3. concealment allows for unique situations, and is especially popular for females due to sculpted waistline clothing such as cropped belly-showing outfits. (see also the Galco Jackass shoulder holster) 4. comfort is amazing. you will *never* find a more comfortable way of wearing/concealing a firearm. CON: 1. For what you get, it's very overpriced, even for Galco. 2. Comes with double stack mag pouch, so if you have single stack, you need to purchase a new mag pouch (ideally this should be a trade-in). 3. Expect theis holster to be as time consuming to draw as an IWB holster with a shirt tucked in. You are likely going to need two hands to draw (see next point). 4. Poor draw design: end of handgun (can) sit directly above belt, yet there is no way to attach the holster to your belt; which is idiotic, since without a holster-to-belt attachment strap, you can not easily draw one-handed. RELATED: Galco sells a number of shoulder-holster-to-belt attachments that work with their Jackass (the 'haha my loaded firearm is pointing at your face when you stand behind me') holster, but somehow they forgot to include this on the VSS handgun holster. ADDITIONAL: the mag pouches *CAN* be attached to the belt via the SC7/SC9 handcuff case, and galco makes a flashlight belt attachment. neither can be mounted to the VSS handgun side of the holster though. 5. fitting and adjusting this holster to your body takes several days and requires patience. whatever position you put the holster in, it's not going to feel proper. look at the Galco site to see how to properly fit the holster and then START there. wear it for a day or two, practice drawing, etc. then change a strap and try it again for another day or two. It took me no less than ten tries to get the holster where it felt comfortable to wear, easyish to draw, properly cant'ed (angled), etc. do yourself a favor and keep a written log of how many holes are showing on each strap along with any notes on how it feels. I've 'oft mused about modifying my setup by purchasing the Galco belt straps and having someone sew the straps to my holster.